The ability of a university degree to pave the way for higher earnings has not been eroded by the increase in student numbers, say researchers. The Institute for Fiscal Studies (IFS) has compared the advantages in incomes of UK graduates from the mid-1980s with those from the mid-1990s. Despite student numbers more than doubling in that time, the wage premium for graduates remained unchanged. Researchers also found that the number of graduate jobs had expanded. But they warn that the rising numbers of graduates could diminish their higher level of earnings in the future. The research also found that the biggest factor reducing the real value of earnings for all types of employees - graduates and non-graduates - had been the lack of wage increases since the recession. On Thursday, hundreds of thousands of teenagers will find out whether they have got the A-level grades they need for university places. The IFS, a leading financial think-tank, has examined whether increasing numbers of university students have caused a decrease in the value of a degree. The study compared two cohorts of graduates, born about a decade apart, and found that graduate earnings showed no sign of being diminished by the growth in student numbers. "The fact that the dramatic increase in the number of graduates in the early 1990s did not have any discernible negative impact on graduates' wages relative to school-leavers is remarkable," said researcher Wenchao Jin. The study examined the typical earnings of graduates born between 1965 and 1969, who were students in the 1980s when only 14% of that age group went into higher education. Their earnings were compared with graduates born a decade later, who would have been students in the 1990s, and of whom 31% went to university. Researchers found that despite the big increase in those obtaining a degree, the relative average earnings difference between graduates and those who left school after GCSEs did not shrink. This durability of graduate earnings reflected changes in the economy. For instance, more graduate-level jobs were created, as lower-skilled jobs disappeared. The study suggests that the way firms were organised changed as an increasing proportion of their employees were better qualified, with less "hierarchical" and centralised management structures. But the study warned that this "process cannot go on forever and there are now signs that it might be reaching a natural end". 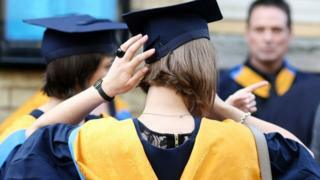 "Further increases in the number of graduates could start to erode the graduate wage premium in the future. "This does not, however, imply that getting a degree will not be worth it any more. It's just that the gain might be smaller in the future than it is now," the report's authors added. However, the study did show a more immediate negative impact on earnings for all employees in the wake of the recession. This wage stagnation affected both those with and without degrees and the IFS says that in real terms, hourly earnings for recent graduates fell by nearly 20% between 2008 and 2013. According to the analysis, this means that the value of typical earnings in 2015 had fallen back to the levels of the mid-1990s, when the second cohort in the study were graduating. Why do more women than men go to university? Clearing: What are options when grades fall short?